There is this little spider that is really complicating my life. He has decided that the best place for him to setup his bug-catching operation is in the corner of my garage door. 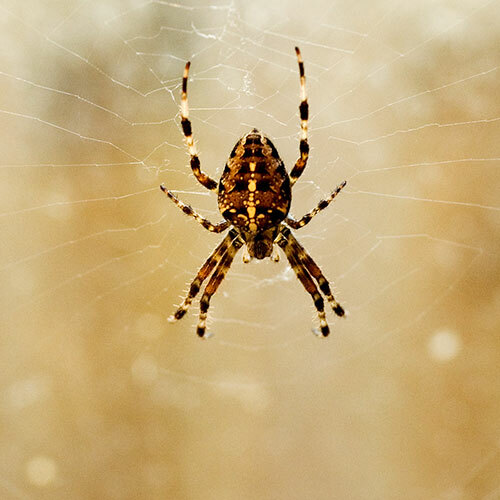 He ingeniously builds the web so the garage door can go up and down without causing him any problems. And he is right on the flight path of all those bugs who rush into the garage heading for the house, so his little business is booming. The problem is that his web is also in my flight path (and about face high) when I take out trash or let the dog out in the backyard. Not being one who learns easily, I walking out of the garage right into his web-- I’ve done that a 3-4 times now, and it's getting old. You know that little dance you do when you walk through a spider web and your swinging your hands around trying to get it off? I’m sure that looks pretty goofy to the neighbors who can’t see the web but can see you! The whole problem is made worse by the fact that my little friend is so successful catching bugs that not only do I have a spider web all over me, but it is interspersed with the carcasses of the dearly departed. In addition to the times I've walked through the web, twice I have gotten out the broom and carefully dismantled his whole operation. But the next day my little friend is back with a whole new engineering marvel. This arachnid simply will not give up. He was there again this morning, but I did finally remember to step around him.I also decided that I needed to learn from him. Matthew 10:22- But he who stands firm to the end will be saved. 1 Corinthians 13:7- It [love] always protects, always trusts, always hopes, always perseveres. 2 Timothy 2:12- if we endure, we will also reign with him. Hebrews 10:32- Remember those earlier days after you had received the light, when you stood your ground in a great contest in the face of suffering. Romans 12:12- Be joyful in hope, patient in affliction, faithful in prayer. James 1:12- Blessed is the man who perseveres under trial, because when he has stood the test, he will receive the crown of life that God has promised to those who love him. The same Greek word (hupŏmĕnō) is used in all of these texts and is translated variously by “stand firm,” “persevere,” “stood your ground,” and “patient.” It means to “stand firm by holding one’s ground.” It is one of the characteristics that allows faith to be maintained despite the difficulties and hardships that people of faith will suffer. Things will not always go well for us, but God expects us always to endure. Sometimes when we use the word "patient" when what we really have in mind is “stoicism.” The patient person will wait without complaint or question-- at least that’s what we want out kids to do! The patience the Bible describes is more like my little spider who keeps on coming back despite the dummy who walks through his web. Sometimes faith means that we keep showing up.